So... 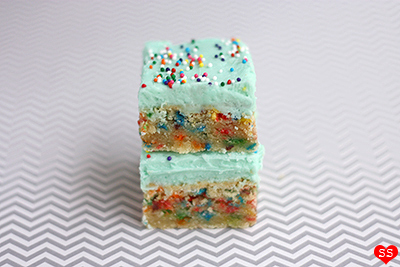 I really love sprinkles (I've found that this is a common trait among baking bloggers). I'm that person who always reaches for the sprinkle covered donut (is it donut or doughnut? ), who drowns my sundaes in sprinkles, who chooses funfetti over vanilla or even chocolate, who always says "yes!" to "do you want sprinkles on that?" (not that I get asked this very often :P). 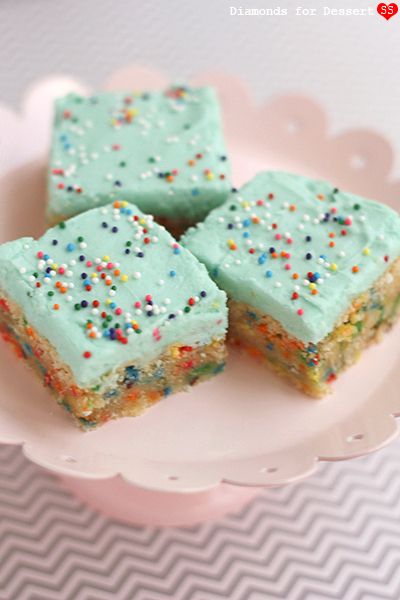 I love the pop of color sprinkles can add to any dessert. This recipe is definitely one that is going in my go-to recipe collection. It's fairly straightforward to make. The cookies turn out soft and chewy with a nice touch of fluffy frosting on top. And in addition to being tasty, they're nice to look at. 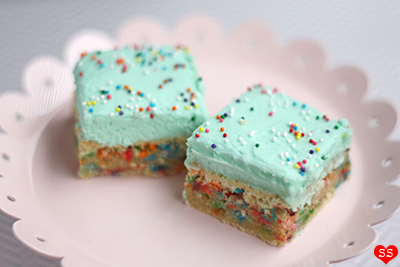 You can use whatever color of food coloring for the the frosting and the sprinkle mix of your choice to decorate the tops. 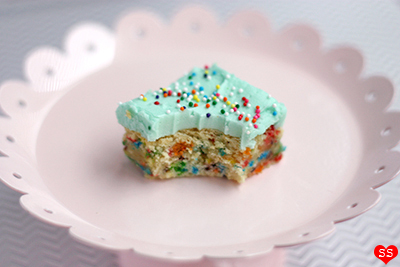 With all the dreary winter weather lately, I find that a rainbow sprinkle covered sweet, like these frosted sugar cookie bars, can really brighten up the day :). Bar Cookies: Preheat oven to 350°F. 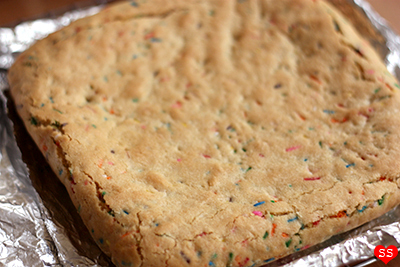 Cover an 8-inch or 9-inch square baking pan with foil leaving an overhang (to easily lift bar cookies out of pan after baking). Spray foil with nonstick spray. Set aside for now. Cream butter with sugar in mixing bowl. Mix in egg and egg yolk. Add vanilla extract. In another bowl, combine flour, salt, baking powder, baking soda, and cornstarch. Add 1/3 of the dry ingredient mixture to the wet ingredients, repeat 2 more times until all wet and dry ingredients are combined. Fold in rainbow sprinkles. Spread the batter in the foil covered baking pan. Bake bar cookies for 25 minutes, or until lightly browned on top. Let cool on wire rack before decorating with frosting. Vanilla Frosting: Combine softened butter with powdered sugar. Add cream and vanilla extract. If using unsalted butter, consider adding the pinch of salt to balance out the sweetness. Add more powdered sugar or cream if too thin or thick respectively. Tint with food coloring (1-2 drops for pastel color). 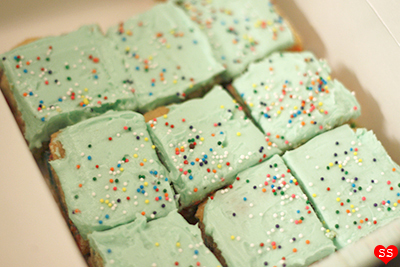 Spread frosting over cooled bar cookies. 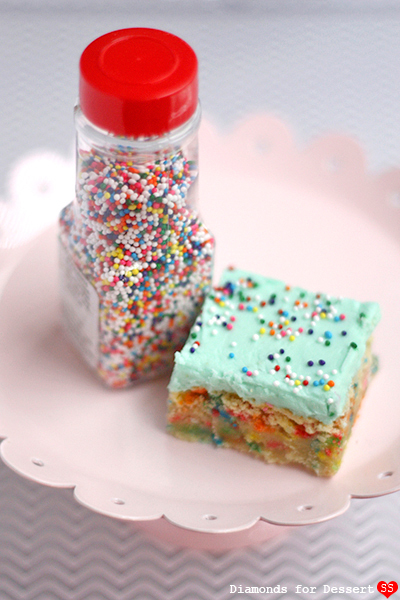 Decorate with extra sprinkles. Cut into squares, wiping knife off on paper towel between cuts. Enjoy! Love it! Everything needs sprinkles! 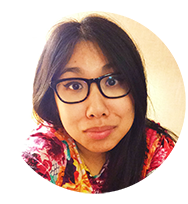 Me: doctor by day... artist, baker, blogger, nature seeker, food lover, reader, DIY-er, dreamer, world explorer whenever possible! Feel free to leave comments on any of my posts, old or new, or send me an e-mail. I love to help and answer questions!